Domain Duclaux belongs to the family only since 1987 although it was established around 1750. Typically for a Cháteauneuf du Pape this wine is a cuvee of Grenache, Mourvèdre and Syrah. The wine has a beautiful, dark red color but still lighter than other, more creamy ones. Although you have a very complex flavor while you realize drinking something rather big, there is an enjoyable refreshing chill while nipping. You can have this wine with any kind of grilled, baked, fried and cooked red meat. And heavy sauces. It is also an excellent company for cheese with a lot of aromas. 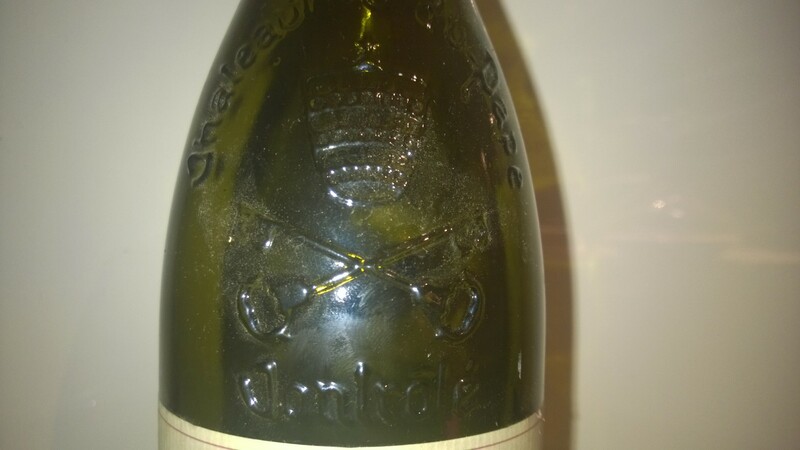 This wine is for sure more conventional than for instance the same type of from the Domaine de Beaurenard (https://avdwineandfood.wordpress.com/2015/03/14/domaine-de-beaurenard-chateauneuf-de-pape-2007/). To compare both shows you the potential variety of wines from this area. Both of them are certainly rather clear and made without any compromises in regard to any fashionable requests. May be Cháteauneuf du Pape is most trendy and popular brand of wines of the Rhone – the Southern Rhone I should say since there is almost not a single kilometer along this river without winemaking: in the Switzerland the Rhone is the spring of many interesting and great wines as for example Petit Arvine of Varone (https://avdwineandfood.wordpress.com/2015/06/27/heritage-varone-2007-petite-arvine-aoc-valais/). Another culture reference for this wonderful wine area is the Catholic Church. Cháteauneuf du Pape is a reference to a castle of the pope, as the French name clearly says. Not to far away from there is the city called Avignon which between 1309 and 1423 was the seat of the pope of Roman Catholic Churches. Yes! There was a time when we had two popes (even for some very short periods three)! Why not to vote for another president if you can have two….. The summer residence of the popes was in the villages which gives the name to all these famous wines. That is for instance the reason you find the symbol of pope’s head on each Cháteauneuf du Pape bottle.